DON’T GET LEFT BEHIND – ALL MAKES & YEARS WELCOME! 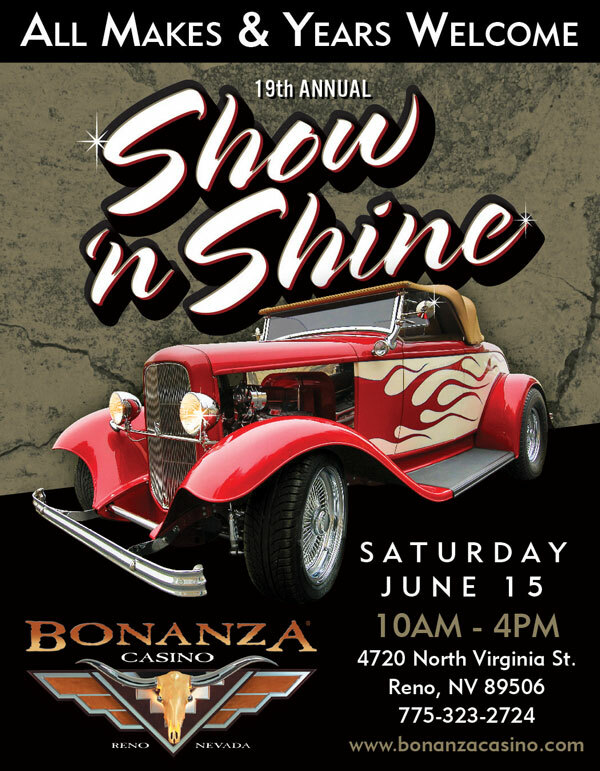 The 19th Annual Bonanza Casino Show ‘n Shine event on June 15th from 10:00 AM TO 4:00 PM will feature a 1932 Ford Roadster along with the hottest classics, cars, trucks, hot-rods, roadsters and customs in Northern Nevada. Registration to participate is free and prizes are awarded to the top six entrants. You don’t want to miss this event filled with live outdoor music, food and gaming specials for all participants! • Food & Gaming Specials, including FREE SLOT PLAY! *While Supplies Last. Management Reserves All Rights.